The vendor show at the Mid-Ohio Produce Growers Meeting. MOUNT HOPE, Ohio — The first event to be held in the newly-built Mount Hope Event Center drew more than 1,200 people who were interested in growing produce. 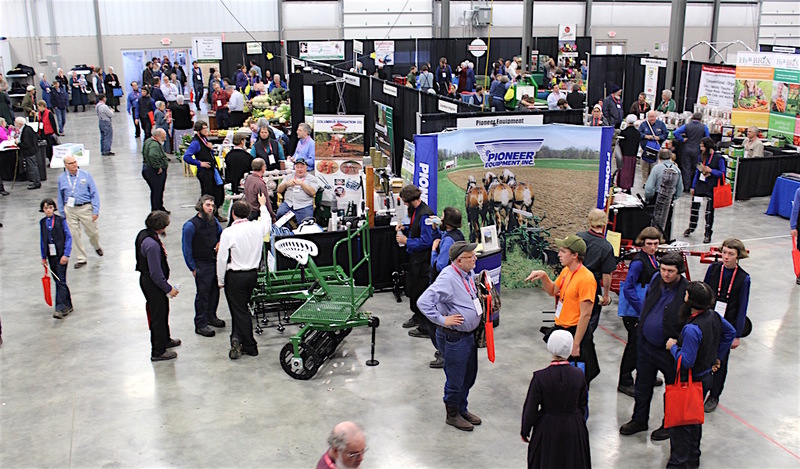 The Mid-Ohio Growers Meeting, held Jan. 12-13, brought growers from across Ohio and surrounding states — all looking for ways to improve their operation. Brent Baker, of Manfull Orchards in Carroll County, talked about what it takes to plan a new apple orchard. The first step, Baker said, is choosing what variety you will grow. There are about 7,500 cultivars of apples to choose from, so you need to consider your customer base and also what will grow well on your land. You also need to decide which rootstock to plant, keeping in mind that the rootstock you choose is what determines spacing in your orchard. Baker said growers also need to consider whether a previous apple tree had been growing in the same area, because apple trees emit a toxin in the soil that can be fatal to new trees, unless the rootstock is resistant. “A successful orchard is only as good as the thought and planning that go into it,” he said. 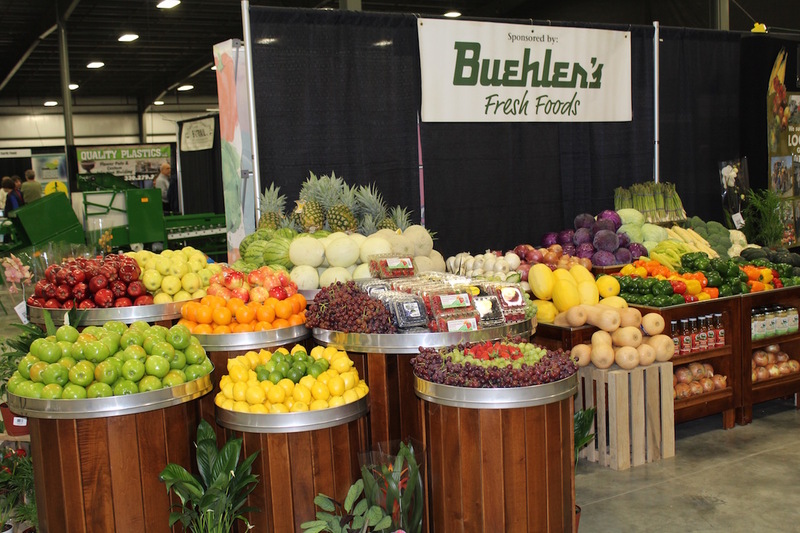 The Buehler’s Fresh Foods display at the conference. You should order your rootstock well in advance of when you need it, because it can take nurseries one to two years to have it ready. Other considerations include site location, and of course, soil preparation. Baker said the ideal site is on rolling or elevated land, so the cold air can drain during spring frosts. But at the same time, higher elevations can sometimes lead to winter cold damage, he said. When preparing to plant, he uses a deep tiller pulled behind a tractor that digs down about 30 inches, breaking up the hardpan, as well as old tree roots. Deep tilling also helps aerate the soil and increases the drainage capacity. In a separate talk, Sally Miller, professor of plant pathology at Ohio State University, gave growers some tips on managing soil-borne diseases in vegetables. One of the biggest things, she said, is managing the amount of water you give your plants and seedlings. Over-watering leads to bacterial diseases, so plants should only be given the amount of water they need. Maintaining an ideal growing temperature is also important, and so is keeping the organic matter up, which helps the soil retain moisture. Vegetables should have at least 2 percent organic matter, she said, with 3-4 percent even better. Organic matter can be increased by adding compost or growing cover crops, that are in turned mixed into the soil. In a talk on food safety and federal regulations, Theresa Klaman, inspector with the Food and Drug Administration, said growers have a range of compliance dates before they’ll be inspected, but producers should already be practicing Good Agricultural Practices — and be preparing for the future. The final produce safety rule was published in November 2015, and producers generally have two-to-three years to become compliant, depending on what they grow and at what size. The smallest producers — who grow $25,000 or less a year in food crops, are exempt from the new rule. Klaman said FDA is in the process of training inspectors and plans to work with state and local entities to eventually conduct the inspections. Related: Produce growers gearing up for new federal rule. Klaman said FDA will respect the different ways growers produce food, the different sizes of farms, and the different biosecurity practices. But at the same time, she said the new rules reflect the need to improve certain farming practices, with the goal of reducing foodborne illness. “The whole goal is to build the relationship with the farmer while still promoting public health,” she said. Other speakers, such as Emanuel Erb of Conneautville Canvas, talked about the social aspects of growing produce and working together as a family. Erb’s family ventured into the canvas and tarp-making business in 1967, in Holmes County, and now operates from Conneautville, Pennsylvania. His children have always been involved with the business — something he’s enjoyed over the years, but also something that took some effort. He started them when they were young, making sure they got up early and helped with the chores. Eventually, getting up early became a habit, and his children took on more responsibility and new roles within the company. Erb said today, there are certain things with canvas that his children can make better than he can make — but he’s not ashamed. He said it’s good when your children surpass you, because it means they’re learning and growing. “When you experience something like that, don’t feel bad about it,” he said. Erb also advised families to take each day at a time — and to not fall for something that sounds too good to be true. “No need to be too involved in the GRQ (Get Rich Quick scheme),” he said.